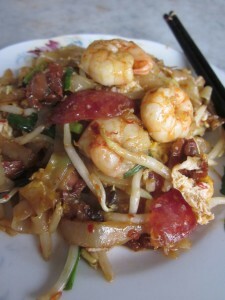 Now I really remember this Char Koay Teow, he used to sell fried beehoon too in his younger days before he he diverted and concentrate fully on CKT. One hour waiting time for me, it was well worth it. No wonder the Penangites crowned him as the King of CKT. He starts his biz at 2.00 pm and finishes at 8.00 pm. Prices are reasonable @ RM3.50, RM 4,50 and RM5,50. 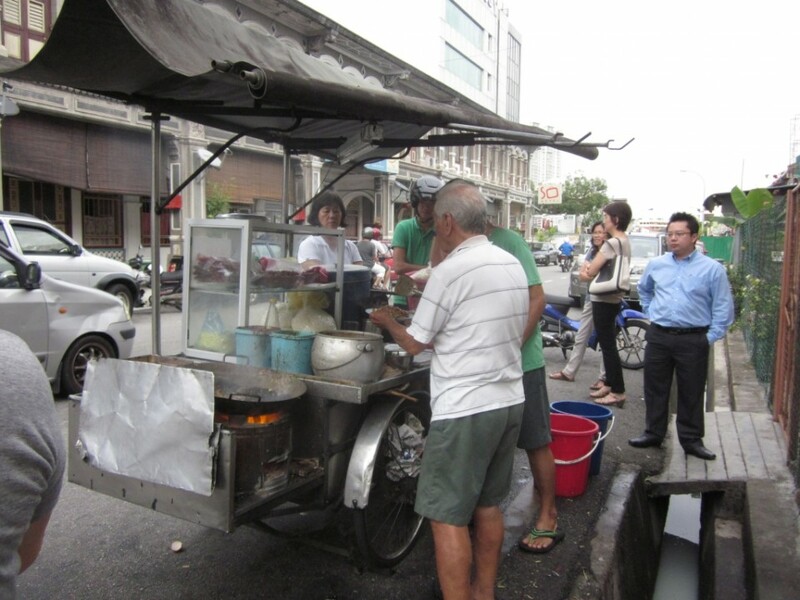 Situated near the junction of Jalan Siam and Jalan Anson. One hand keep fanning the charcoal fire and the other hand keep frying. 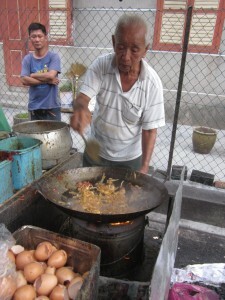 In some other comments from other posting and other websites saying that he fry his CKT in big batches but I do noticed that when he added in the Chinese sausages and egg, he separated each portion to do that, Wok Hei definately thumbs up. I guess if he don’t do that in bigger batches, he won’t be able to cope with the sales. I ordered a plate to eat there and 3 packets of takeaways. But I can assure you even after 2 hours, I ate the takeaway packet, I can still smell the wok hei, taste is still as good as freshly fried but of course I would prefer my CKT eaten freshly cooked and warm. Indeed worthy to be crowned as King of CKT, even prices of ingredients are more expensive, he still maintain the size of the prawns he uses and the rest of the ingredients. I would say one thing even if he were to charge a little bit more expensive and not skim on the ingredients (which he never do) I will still eat there.